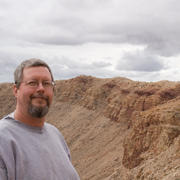 I started out as a life long amateur astronomer, with a primary interest in Planetary Astronomy. In the early 1990s I purchased several micro samples, including a 0.3 gm sample of Zagami. My personal collection grew slowly. In 2005 I became a member of the Catalina Sky Survey in Tucson, Az., which as you know is actively involved in finding Near Earth Objects. In the course of my normal duties with CSS, I discovered 2008 TC3 using our 1.5-m (60") telescope at the summit of Mt. Lemmon. This was the first object discovered before it enetered earth's atmosphere.The meteorites from this predicted fall are now being recovered and are known as Almahata Sitta. Though my work is discovering the parent bodies of meteorites, I only collect meteorites as a personal hobby. Since the recovery of meteorites from 2008 TC3, my collection has grown rapidly. My primary collecting interest is in building a type set. My collection is mostly made up of small specimans, micros and micro-micros and was "completed" in early December 2009.